How do you get a 12/13 month old to hold his bottle or sippy cup? He seems to be very lazy about this. He was born a month early and weighed 4lb 12oz at birth. One year olds should be feeding themselves. They should be off bottles and eating table foods. 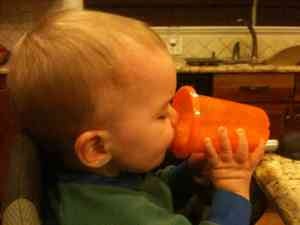 (...more on feeding 12 month olds) There are two issues to taking a sippy cup 1.) the ability to get fluid out of the cup and 2.) the desire to drink. I’m surprised by the amount of force required to make a “no-spill” sippy cup work. You may have to try a variety of cups - straw cups or cups that leak when upside down. Sometimes we have to pull the no-spill valves out for children to begin to get the concept. The second issue is getting the child to hold the cup and drink independently. Children that can crawl should physically be capable of feeding themselves. The child must have the desire to drink for this to happen. When you think he is thirsty, place the sippy cup in front of the child. You can place his hands and get him started, but do not hold it longer than that. Eventually, thirst will motivate him to drink. You may try feeding him around other toddlers as modeling can be a powerful force.